The bestselling and critically acclaimed debut novel by Lisa Halliday, hailed as “extraordinary” by The New York Times, “a brilliant and complex examination of power dynamics in love and war” by The Wall Street Journal, and “a literary phenomenon” by The New Yorker. Told in three distinct and uniquely compelling sections, Asymmetry explores the imbalances that spark and sustain many of our most dramatic human relations: inequities in age, power, talent, wealth, fame, geography, and justice. The first section, “Folly,” tells the story of Alice, a young American editor, and her relationship with the famous and much older writer Ezra Blazer. A tender and exquisite account of an unexpected romance that takes place in New York during the early years of the Iraq War, “Folly” also suggests an aspiring novelist’s coming-of-age. By contrast, “Madness” is narrated by Amar, an Iraqi-American man who, on his way to visit his brother in Kurdistan, is detained by immigration officers and spends the last weekend of 2008 in a holding room in Heathrow. These two seemingly disparate stories gain resonance as their perspectives interact and overlap, with yet new implications for their relationship revealed in an unexpected coda. 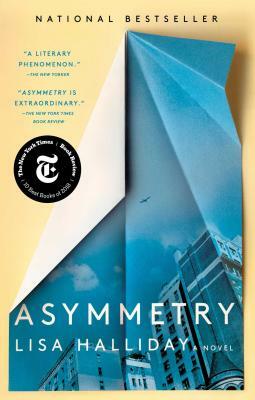 A stunning debut from a rising literary star, Asymmetry is “a transgressive roman a clef, a novel of ideas, and a politically engaged work of metafiction” (The New York Times Book Review), and a “masterpiece” in the original sense of the word” (The Atlantic). Lisa Halliday’s novel will captivate any reader with while also posing arresting questions about the very nature of fiction itself. Lisa Halliday grew up in Medfield, Massachusetts and currently lives in Milan, Italy. Her work has appeared in The Paris Review and she is the recipient of a 2017 Whiting Award for Fiction. Asymmetry is her first novel.